As was the custom in England, the Pilgrims celebrated their harvest with a festival. The 50 remaining colonists and roughly 90 Wampanoag tribesmen attended the "First Thanksgiving." The major similarity between the first Jamestown settlers and the first Plymouth settlers was great human suffering. November was too late to plant crops. Many settlers died of scurvy and malnutrition during that horrible first winter. Of the 102 original Mayflower passengers, only 44 survived. Again like in Jamestown, the kindness of the local Native Americans saved them from a frosty death. The Pilgrims' remarkable courage was displayed the following spring. When the Mayflower returned to Europe, not a single Pilgrim deserted Plymouth. Massasoit, chief of the Wampanoag tribe, signed a treaty with the Pilgrams in 1621, that was never broken. As a result, the two groups enjoyed a peaceful coexistence. By early 1621, the Pilgrims had built crude huts and a common house on the shores of Plymouth Bay. Soon neighboring Indians began to build relations with the Pilgrims. Squanto, a local Indian who had been kidnapped and taken to England nearly a decade before, served as an interpreter with the local tribes. Squanto taught the Pilgrims to fertilize the soil with dried fish remains to produce a stellar corn crop. Massasoit, the chief of the nearby Wampanoags, signed a treaty of alliance with the Pilgrims in the summer. In exchange for assistance with defense against the feared Narragansett tribe, Massasoit supplemented the food supply of the Pilgrims for the first few years. The modern conception of a Pilgrim might include a man in a black hat with a buckle, but not all of the original settlers of Plymouth County fit this description. Successful colonies require successful leadership. The man to step forward in Plymouth colony was William Bradford. After the first governor elected under the Mayflower Compact perished from the harsh winter, Bradford was elected governor for the next thirty years. In May of 1621, he performed the colony's first marriage ceremony. Under Bradford's guidance, Plymouth suffered less hardship than their English compatriots in Virginia. Relations with the local natives remained relatively smooth in Plymouth and the food supply grew with each passing year. By autumn of 1621, the Pilgrims had much for which to be thankful. 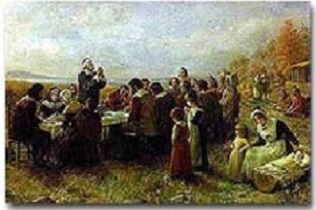 After the harvest, Massasoit and about ninety other Indians joined the Pilgrims for the great English tradition of Harvest Festival. The participants celebrated for several days, dining on venison, goose, duck, turkey, fish, and of course, cornbread, the result of a bountiful corn harvest. This tradition was repeated at harvest time in the following years. It was President Lincoln who declared Thanksgiving a national celebration in 1863. The Plymouth Pilgrims simply celebrated survival, as well as the hopes of good fortune in the years that lay ahead. An interesting timeline showing the development of Thanksgiving as a national holiday. A history of thanksgiving from the Smithsonian includes several celebrations predating that of the Pilgrims. When did you say? The First Thanksgiving Proclamation set June 29, 1676, as the first celebration date! Turkey and gravy, mashed potatoes and corn, pumpkin pie and some more turkey — what do these things remind you of? Thanksgiving, of course. But there is more to this November holiday than delicious food and relatives you haven't seen since in a year. Read about the first Thanksgiving and how this day was recognized as a national holiday at this website.